Oh Mark Curry, where did you go? 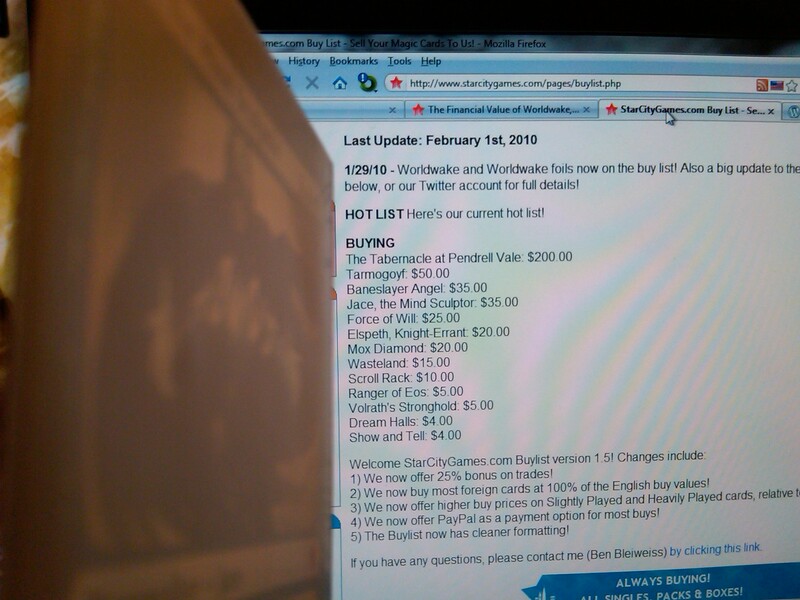 This past weekend was the Worldwake prerelease. I had fun, met a few friends and fellow bloggers, as well as got something so awesome done, everyone who saw it cried intently at its beauty (they should’ve sent a poet). Oh, yeah I played some cards as well. I met up with fellow bloggers GatheringMagic.com. They had decided to come out to the 6:30 am flight to get done early and go in another flight or do whatever crazy people do when they want to do a 6:30 am flight. I got there around 10ish, signed up for my flight, and found Reinhart in the middle of one of his matches. After being a ninja, we decided that we would meet up for an EDH game between rounds. 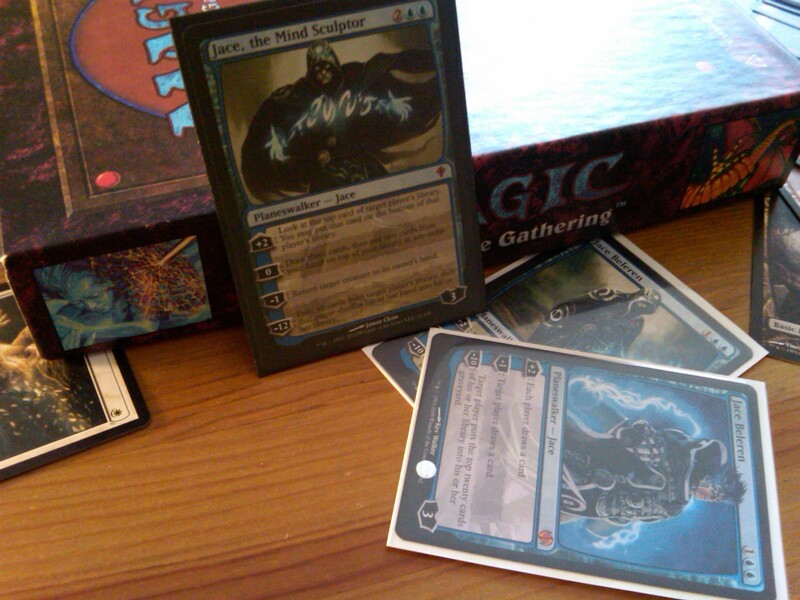 After round 2 (where I was 2-0), I caught up with the GatheringMagic guys again and we started to play a little EDH. There were complaints that they need sunglasses because my cards were all foil. After it was pointed out by someone actually paying attention to the game that Reinhart had an illegal land in play (one that made another color besides his General), we all complained that the game was tainted. We were forced to move our game because another flight that needed the table space and I my next round was about to start. We departed our ways (Leaf and Reinhart left because they got there at 6:30 am, and I had my next round), agreeing that we would defeat each other next time. My prize winnings for going 2-1-1 was 2 packs. 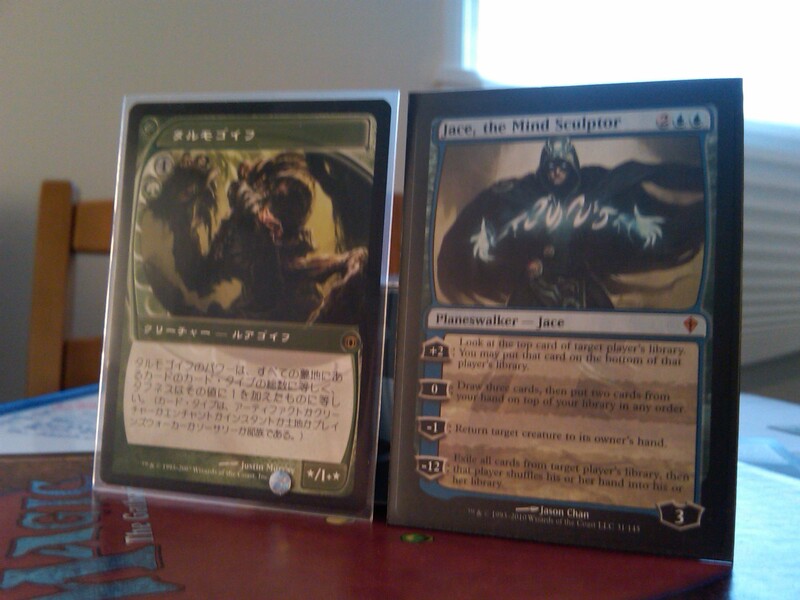 In the second pack (as you can see above) was a Jace. That’s right, the card that’s pre-ordering for $50. 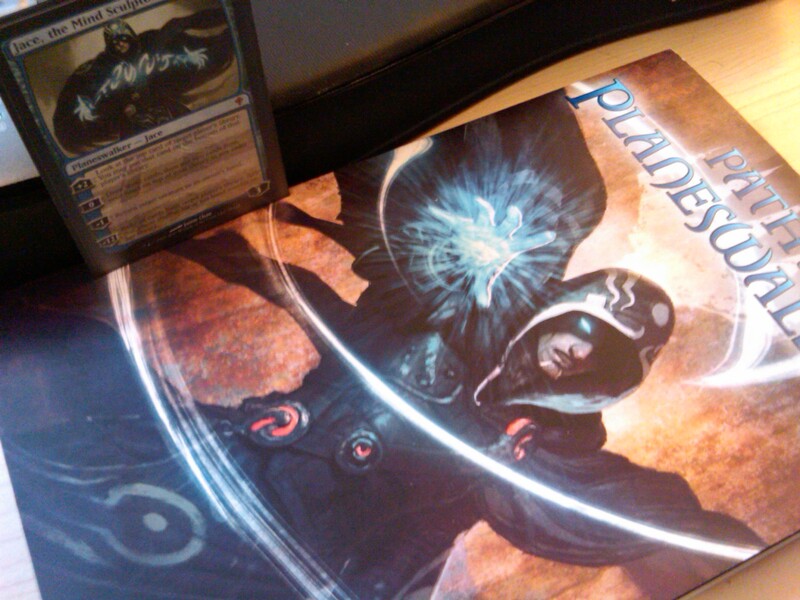 Getting a Jace was an awesome experience; I was high-fiving people and some of the other players came and saw their first real life Jace. The look on their face when they saw it was pretty cool. 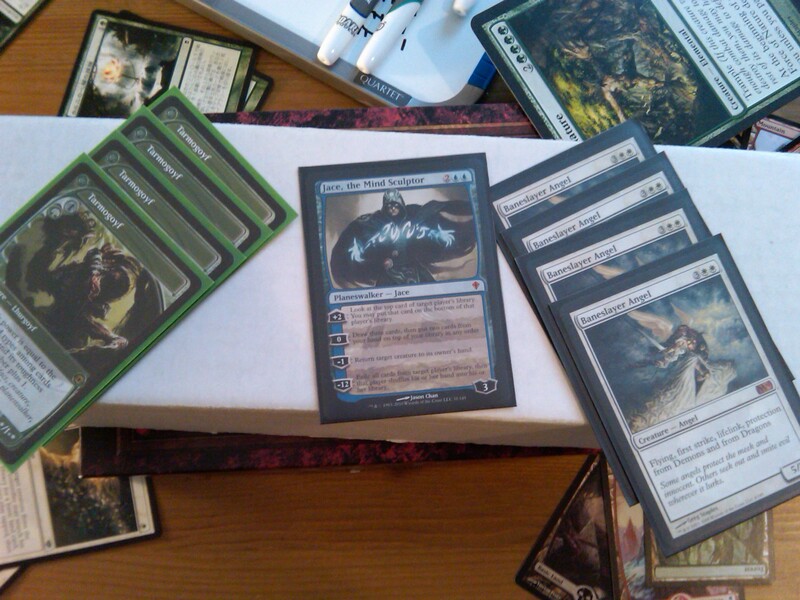 I bragged to GathteringMagic, displaying my winnings. He wanted to trade his 4-0 flight for my Jace (which I think is in some violation of the DCI on so many levels), then when I refused, he called me out. Multiple times. Well, this post is for you, Reinhart. Reinhart is obsessed with Jace; it’s actually pretty sad, he’s got a tramp stamp with Jace’s face on it. So, after the GatheringMagic’s guys left, giving me a bad time about having to go finish my flight, it was sweet to open one of these. 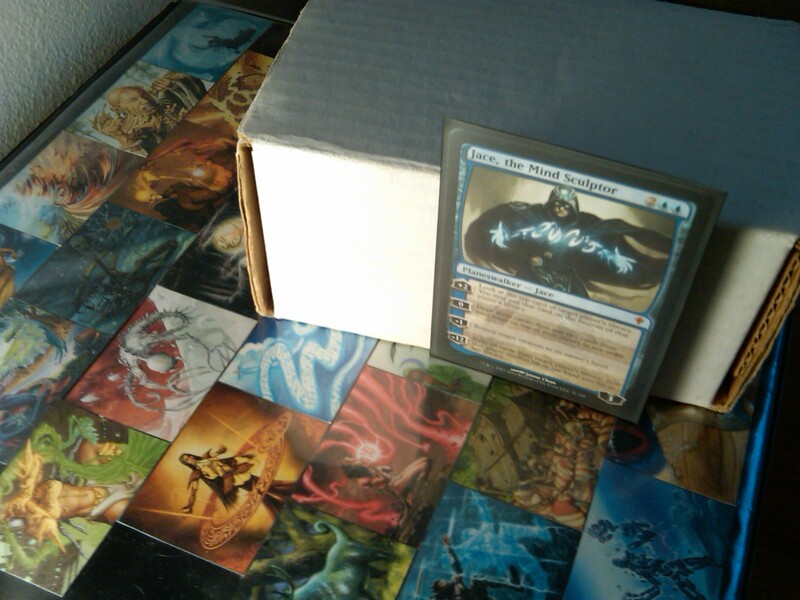 When I awoke the next morning, I found my Jace missing from my card box. I looked everywhere for it, thinking I might have left it at the pre-release, but then I saw something moving on my table. It was Jace. Apprently, this new Planeswalker is so powerful, he can do anything. I took some photos of Jace exploring his new surroundings. Let’s follow him. Jace is showing his former self who's boss. 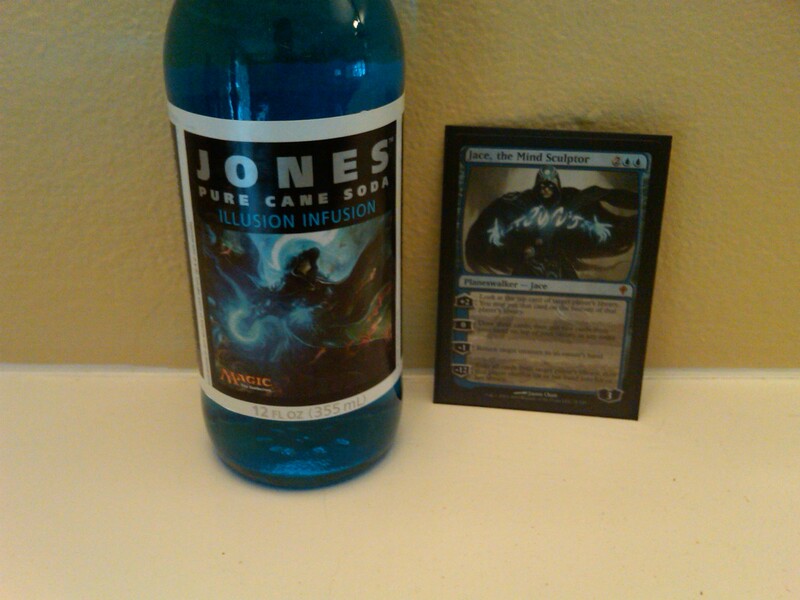 Jace is happy that he's being bought for $35 before he's legal in any format (save EDH). And he thanks Brainstorm for getting that high dollar amount. He feels pity for those in my Trade Binder; he'll never go there. When Jace needs a drink, this is what he reaches for. Wondering when he will get a chance to play with the other high rollers. Though he would like a playset to hang out with as well. I'm working on that. Jace meets the foriegn exchange card. Konnichiwa, 'Goyf-san. Jace thinks he looks good as a cover model. He is ruggedly handsome. 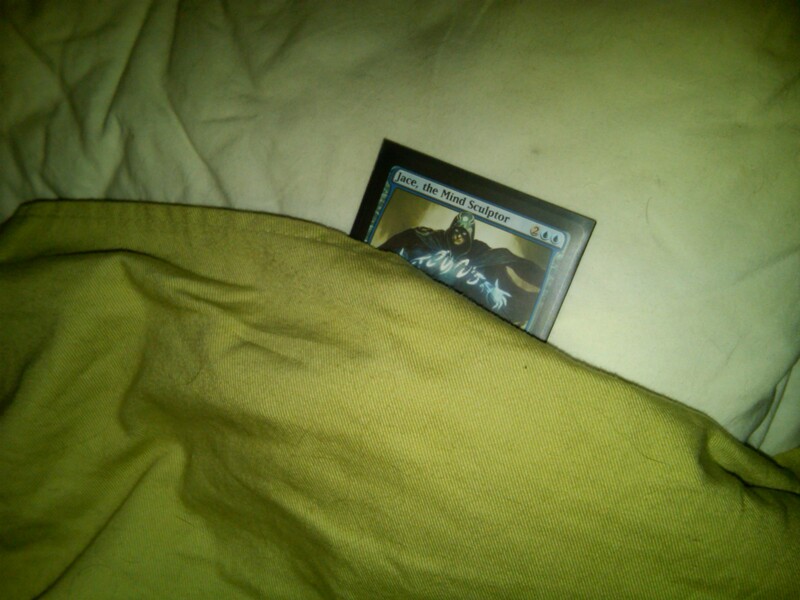 After a long day, Jace needs his sleep. Goodnight, Jace. Here you go Reinhart, you can look at these pictures as much as you want now. Enjoy! Those pictures are completely epic! 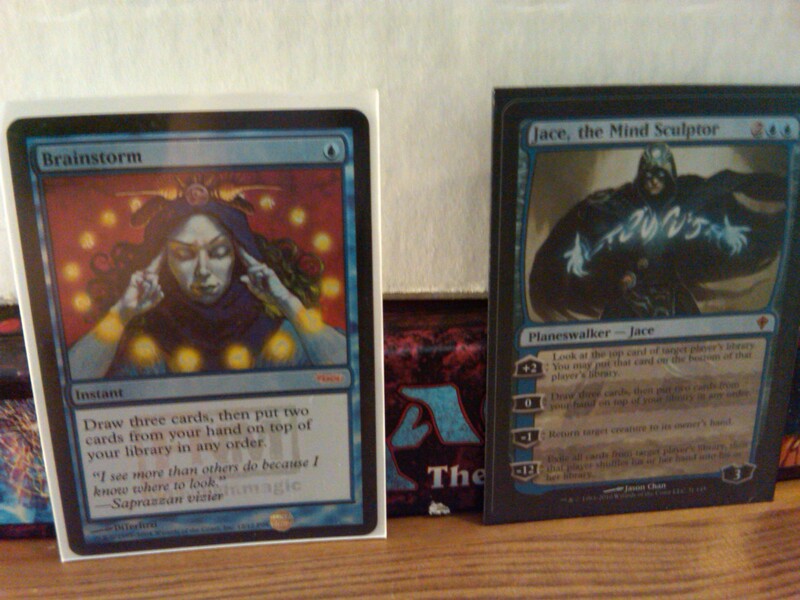 I hope I’m lucky enough to get Jace, the Mind Sculptor… though as long as I have my Chandra Nalaars and Ablazes, I’m happy! Lol. I got one too! 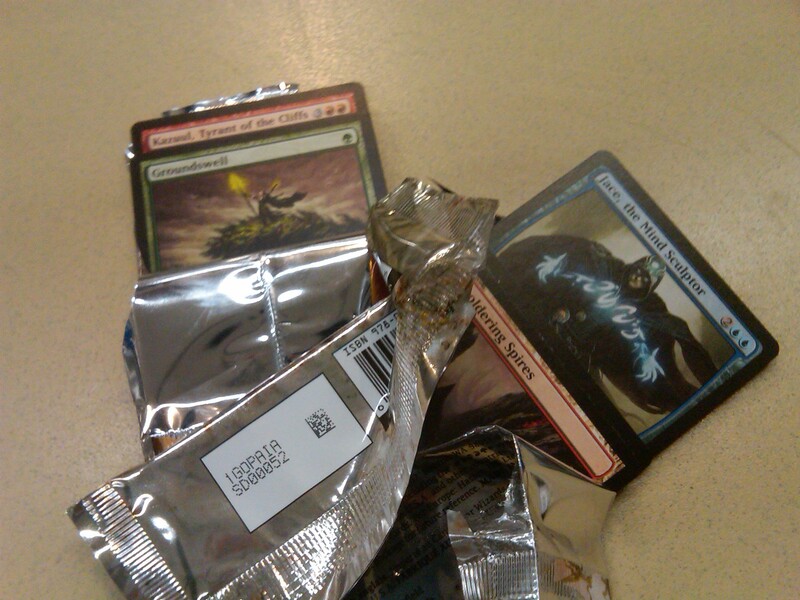 That’s nothing, I got one during the prerelease and the following week I bought a fatpack and pulled two from it. Needless to say I’m sure I used up my MTG luck this year. Nice post. I got really lucky. I cracked open a cube and got 2 Jaces and then during the pre-release I opened up another one and won the pre release and got 3 more with the packs and the fat pack. 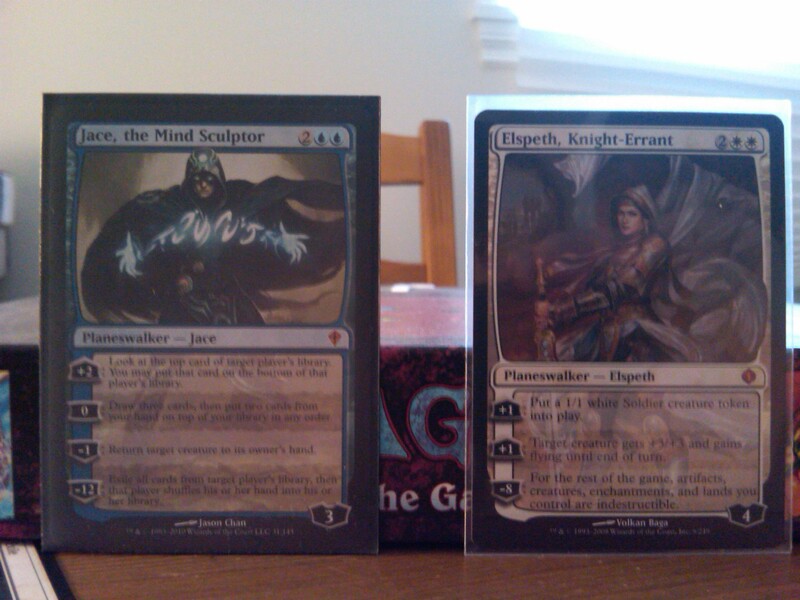 Later I traded my baneslayer and elspeth Knight Errant playsets for another 2. So I have 2 playsets well, I have one playset The other one went on ebay. Now I’m selling 2 on ebay and trading the other two for a bunch more rare cards to go on ebay.